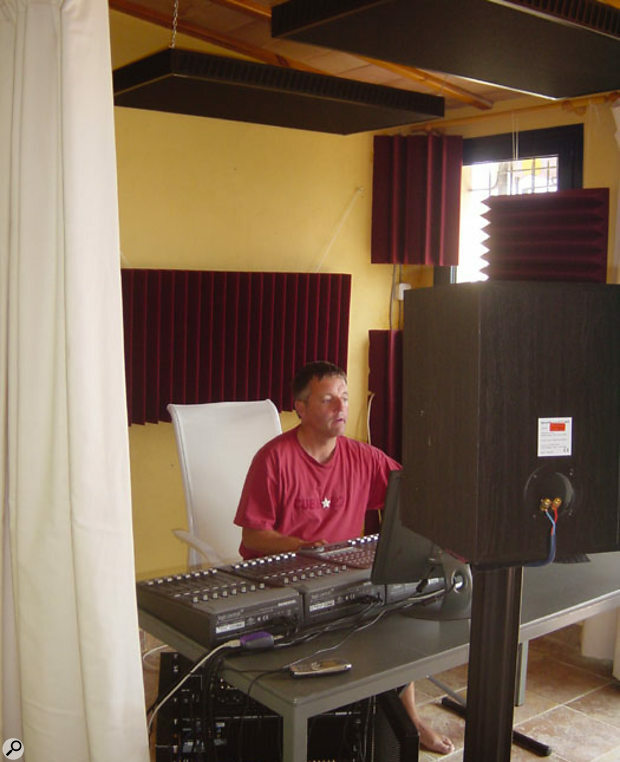 This month, we help television composer Dave Lowe transform a cavernous-sounding spare bedroom into a usable home studio. 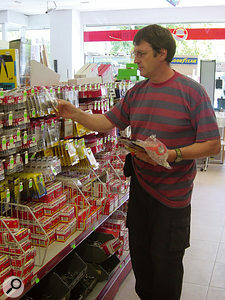 David Lowe is one of today's more successful writers of TV music. 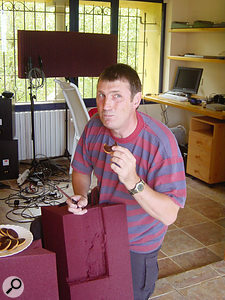 He is probably best known for the current BBC news theme, though he has also produced some excellent hard-hitting drama themes, such as Mersey Beat and, of course, the pop single 'Would You?' under the name Touch & Go. You may also recall that some months back he agreed to let me co-write the Royal Gardeners theme with him, so when he asked for help with his studio I could hardly turn him down! 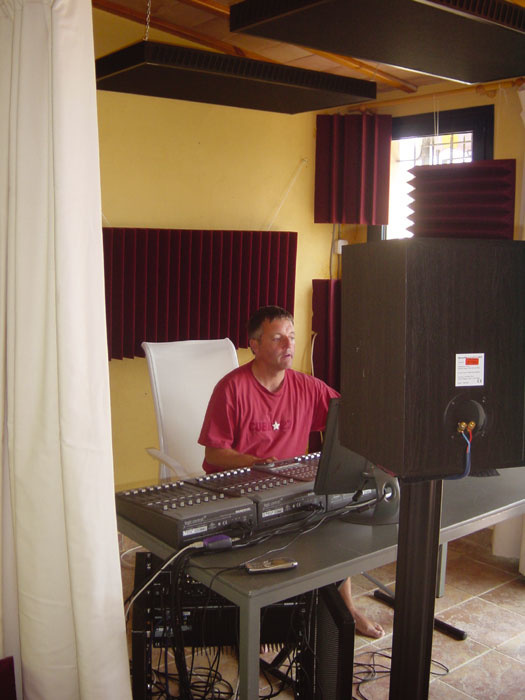 He needed help to turn a bedroom in his Spanish villa into a studio that could be used not only for writing but also for tracking and occasionally mixing. Although his main studio is near Malvern, David already has a duplicate setup in his London apartment and he wanted to do the same in Spain, so that he could continue working on his TV and album projects when away from home. Like most villas in the area, David's has hard tile floors, solid rendered walls, and (in the case of his studio room) flat terra cotta tiles on the sloping ceiling, below the main roof tiles. This gave it a sound rather like an '80s live drum room: very reverberant, and far too resonant to mix in. The upstairs room he'd chosen had patio doors looking out onto a veranda, but also had a two-metre opening looking out onto an adjacent room, which he felt might be useful for recording vocals. The studio room itself turned out to be fairly small, measuring around 3 x 2.5m, but the shape was also somewhat awkward, because of the large opening into the next room. To complicate things further, the adjoining room contained a door leading to a stairwell, and if this was left open the stairwell reverberation made its presence known in no uncertain terms! A large area of foam treatment was created by sticking multiple foam panels to MDF, and this could then be hung on the wall like a picture. Finding space for the equipment was not a problem, as David wanted to keep this studio simple. The equipment comprised of a dual-processor Mac G4 running Emagic Logic Pro, a Logic Control with two expanders, and a MOTU 2408 interface. An Emagic AMT8 was in place to handle the MIDI (though we had to make do with an MT4 and just the main Logic Control unit, as David had inadvertently left the AMT8's PSU at home), and an ageing Korg M1 was set up as a master keyboard. This didn't have the audio outs connected, because David intended to use only software instruments. As it turned out, we were just able to slide the M1 on its 'X'-frame stand under the rear of the desk so that only the keys protruded — a useful tip if your 'X'-frame stand won't go low enough for this is to dispense with the securing crossbar and instead use a strap or length of strong nylon cord to hold the top two supports the correct distance apart and therefore provide the necessary height. A Mackie 1202 mixer was used as a front end for recording, and the sole studio mic was a Neumann U87, mounted in a shockmount with a pop shield. Monitoring was courtesy of a pair of Dynaudio BM15s fed from a Samson 550 Servo power amplifier, where the monitors were set up on metre-tall stands and connected with adequately heavy speaker cable. Not knowing what supplies were available in the area, I studied photographs of the studio in advance of the trip and then suggested some materials for David to order and have shipped over. Happily these all arrived before I did! I planned to use simple Auralex foam to treat the walls and corners, augmented by a pair of Real Traps Mini Traps suspended from the ceiling to deal with reflections from that area and also to provide additional low-frequency trapping. I felt that, as far as bass trapping was concerned, the large window area in the room and the one adjoining it would help us, as would the wooden cupboards in the next room. Bass tends to pass through windows rather than getting reflected, so the more window area you have, the more low-frequency energy is lost to the outside world. Cupboards with panelled wooden doors also help damp down bass modes, especially if they contain towels and bedding. 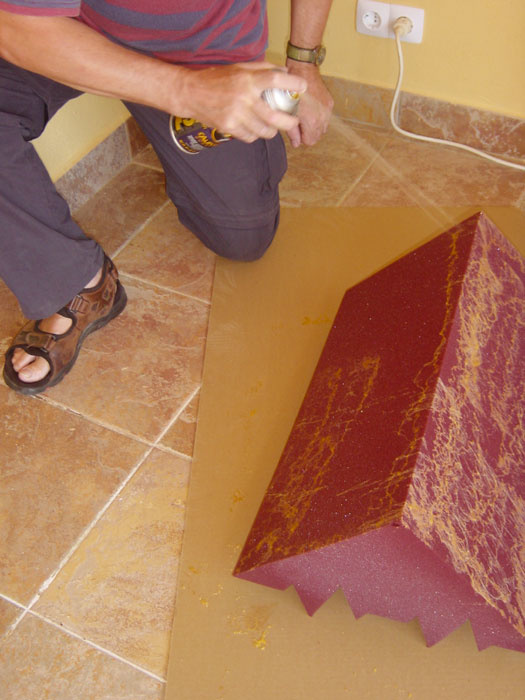 The first step towards reducing the excess reverberation in Dave's room was to install several Auralex acoustic foam panels and corner traps using contact adhesive spray. When I arrived, David had already set up his gear on a table in what he felt was the most appropriate arrangement. This had him looking into an alcove, with the dividing wall between the two rooms on his left. The patio door to the outside was on his right, and the wide opening to the next room was behind him and to his left, so there was no semblance of acoustic symmetry. Before looking at the acoustic problems, I suggested to David that he face his system the opposite way, so that he would be sitting in the only part of the room where he could have a wall on either side of him. This would provide a degree of symmetry, if only in the listening position, and it would avoid obstructing the patio doors. As a bonus, it would also afford David a better view of the outside world during those valued moments of reflection! We moved the table to see how this would look and David agreed it felt better, so we decided to continue work on this basis. The Auralex corner traps went in the two corners behind the mixing position, though these couldn't be exactly symmetrical, given that the roof was higher at one side of the studio than at the other. Also, the lower of the two corners housed some electrical fittings and switches that needed to be left exposed. The traps were glued directly to the painted wall using the included spray contact adhesive — you have to position the traps very carefully when using that stuff, though, as once the glue grabs there's little chance of it letting go again! 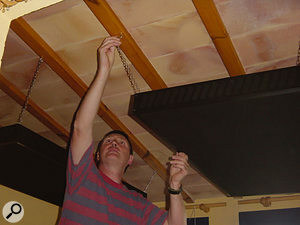 After a trip to the Spanish equivalent of B&Q to purchase the necessary fixings and tools, the Real Traps Mini Traps panel absorbers were rigged to the ceiling of the studio room using hooks and fine chain.To avoid doing anything too permanent to the rest of the walls, the remaining four-inch-thick Auralex panels were glued to MDF sheets and then hung on the wall like pictures, mostly using existing screw holes and wall plugs that had been fitted by the previous occupant to fix hooks. Strong nylon cord was passed between holes drilled into the MDF before the foam was glued in place. Our trip to the local equivalent of B&Q turned out to be interesting, as we not only had to buy all the necessary materials, but also basic tools, such as a wood saw and a hacksaw — however, this was achieved fairly painlessly with the aid of much pointing and drawing of diagrams! Because the room comprised entirely reflective surfaces, I decided on a vertical panel at either side of the listening position with a further sheet suspended horizontally behind the chair at head height. One of the vertical panels was suspended from a curtain rail, as there was a narrow window in the wall to the left of our new mixing position. As the wall behind the monitors was flat and completely bare, I used the remaining three panels of foam to treat that, again fixed to MDF sheet and hung on hooks. The Real Traps Mini Traps work on a different principle, as their performance improves if they are positioned away from a surface rather than directly on it, but in this room it wasn't practical to place them in their optimum position for bass trapping, which is across a corner or wall/ceiling junction at around 45 degrees. Instead I suspended them from chains and hung them from hooks screwed into the ceiling joists, so that they would hang parallel to the floor above the listening position and the desk. This way they would intercept any ceiling reflections that tried to reach the listening position and would also provide additional low-frequency trapping, albeit not as effectively as if they'd been hung across corners. I was surprised at how hard it was to cut what was in effect plug chain, and in the end I had to use a hacksaw, as none of our pliers or wire cutters would touch it! 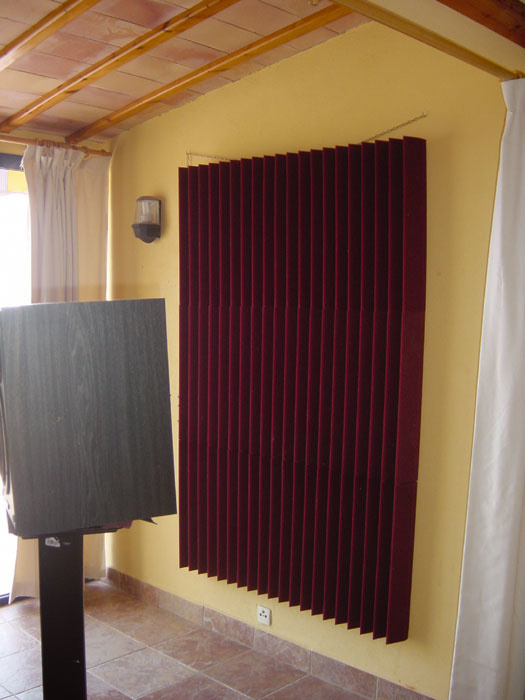 We'd also ordered a pair of Auralex Max Walls, which are foam panels mounted on included stands to provide movable treatment. We placed these in front of the large window in the adjacent room, as David hadn't yet had the blinds made for this room, but the real reason for buying them was to create a localised area that could be used for recording vocals and instruments. David had felt that the adjoining room would make a suitable playing area, but because of the open-plan nature of the two rooms and the amount of noise kicked out by the G4, I suggested that the next bedroom along would be better for this purpose, as it had a double bed in it (which made it sound less lively) and there was space under the door for a mic cable. Once the acoustic treatment was up and the equipment put in place, we found ourselves short of UK mains sockets. David had one spare four-way plugboard with a very short cable terminating in a European plug, so I attacked a UK IEC lead and used it to replace the existing short cable. A European plug adaptor was then used so that we could plug it in. 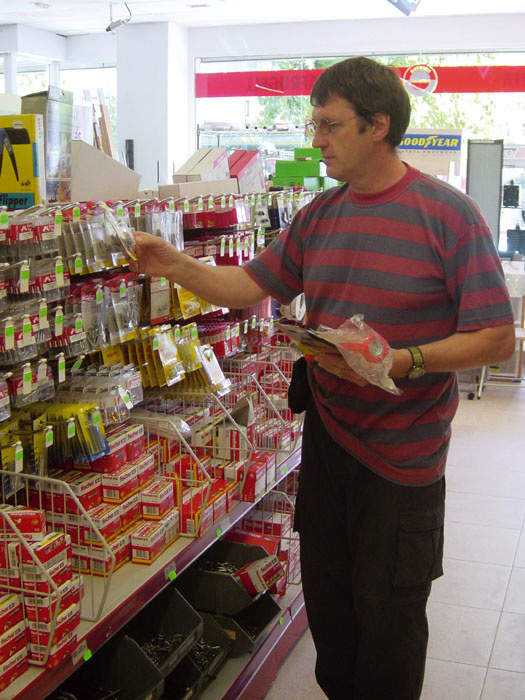 Shortly after this, David said he was getting a tingle when he touched his Logic Control, which revealed an interesting fact about European mains connectors. Although these plugs look like two-pin devices (on account of them having two pins! ), they also have a recessed earth connector on one edge that contacts a matching connector in the wall socket. However, you can insert these plugs either way up, as the socket has grounding contacts on both sides. In this case, one of the contacts had lost its springiness and so wasn't connecting to the plug. By inverting the plug, the earth was restored and the tingling stopped, but replacing the faulty wall socket would be the only safe long-term option. Before doing any listening tests, we had to position the monitors correctly, and with the stands David was using the speakers were around 30cm too high. The answer was to use some foam offcuts as wedges to prop up the rear of the each speaker so as to angle it down and aim the tweeter correctly. 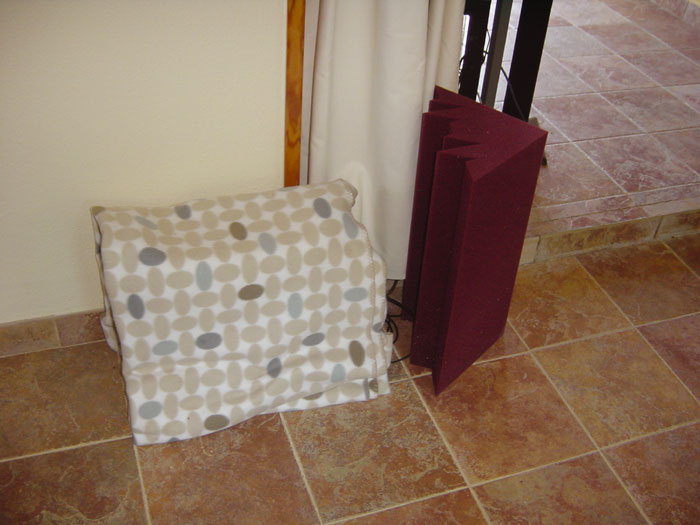 Non-slip matting, from our friendly Spanish hardware shop, was used to stop the speakers sliding off their stands. The BM15s have different left-hand and right-hand speakers, so I set them up with their tweeters outermost to give the widest stereo image. The foam plugs fitted to the bass ports (these come with the speakers) were left in place, as it turned out that there was absolutely no shortage of low end. Checking the audio playback confirmed that the original ringy, splashy space had indeed been tamed to a surprising degree. The bass end was adequately even and there was now much better stereo imaging. The flutter echoes were gone, and talking in the room felt more like talking in a studio rather than in a deserted warehouse. I wouldn't go so far as to say we now had a room you could mix and master in with complete confidence, but at least it was fine for tracking and perfectly adequate for mixing provided that you'd have a chance to master the material elsewhere. David agreed that the improvement was vast, and he also felt that the room had a better working ambience, with a more intimate vibe to it. There was quite a lot of noise coming from Dave's Apple G4 computer, so it was moved further away from the mixing position. Although this helped, a further improvement was achieved by draping a blanket over the top and sides of the computer, leaving the ventilation unhindered, with a piece of acoustic foam placed fairly close behind the machine to soak up a bit more sound.A further acoustic improvement was realised when David hung some heavy made-to-measure curtains that his wife Helen had sent over for him. These went over the patio doors and the opening between the two rooms, but they improved the sound even when open. We tried to source some rugs for the floor, but rug shops (and rugs) seem very thin on the ground in Spain — although the room sounded perfectly usable without rugs, adding them to the studio and adjoining room would doubtless help dry up the sound a little more. I also suggested putting slatted wooden blinds over the very wide window in the adjoining room in order to scatter sound and let in light at the same time. Of course all this new-found peace and tranquillity was disturbed by the racket of the G4 whirring away on the floor, so I decided to try moving it into the adjacent room where the dividing wall and new curtains would offer a degree of screening. A USB hub was pressed into service to extend the keyboard/mouse connections, and the monitor cable was just long enough. 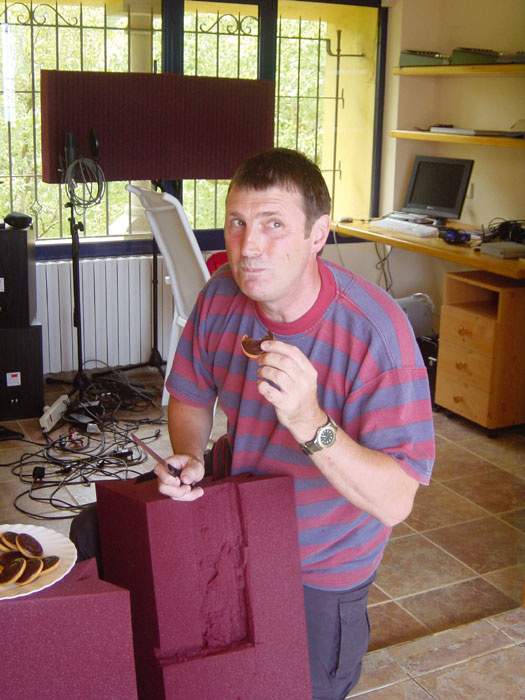 Paul White, Paul White...He's a secret Jaffa Cake eater...A simple sound-deadening trick I discovered when I had a G4 was to place a folded blanket or rug over the computer to form a tunnel, leaving the front and rear of the machine exposed to the air. 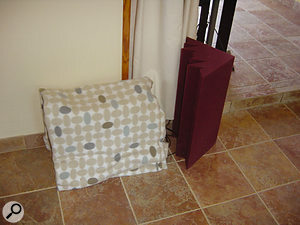 The blanket needs to go all the way to the floor to be effective, but it is essential not to block the ventilation path to the front and rear of the machine. We tried this, adding the spare Auralex bass trap behind the G4 to try to soak up a little more sound. The drop in noise was significant, mainly due to the folded rug and the new computer position. Although still not completely abolished, the computer noise was now barely noticeable from the engineering position. Our last day was spent doing a spot of recording to check out the system, which happily confirmed everything was working fine and that there were no ground-loop hums or other nasties. Even without rugs and blinds, the studio sounded perfectly workable, though it was important to keep the door to the stairwell closed. The only down side was not being able to have Hugh along on the trip, but out of a sense of tradition and loyalty I made sure to eat his share of the Jaffa Cakes! Thanks to Audio Agency and Sonic Distribution for arranging prompt shipment of the acoustic treatment products used in this article. "I must admit to being a bit sceptical about what could be achieved in that room without spending loads of time and money filling in ceilings, knocking down walls, putting in new doors, and so forth. But it had all the makings of a fantastic room to work in, if we could get rid of the huge cave-like reverberations! Paul has worked wonders, achieving far more than I imagined could be done, and all with only a few simple but effective materials, all easily available at comparatively modest cost. When I sat in and listened to some of my tracks in the finished room, it was almost like having headphones on! "An added bonus was Paul's idea to move the setup around the other way, something I'd never have thought of myself, but which was a tremendous improvement. I also loved the tip about lowering the keyboard stand — definitely worth the price of a Spanish packet of Jaffa Cakes!"